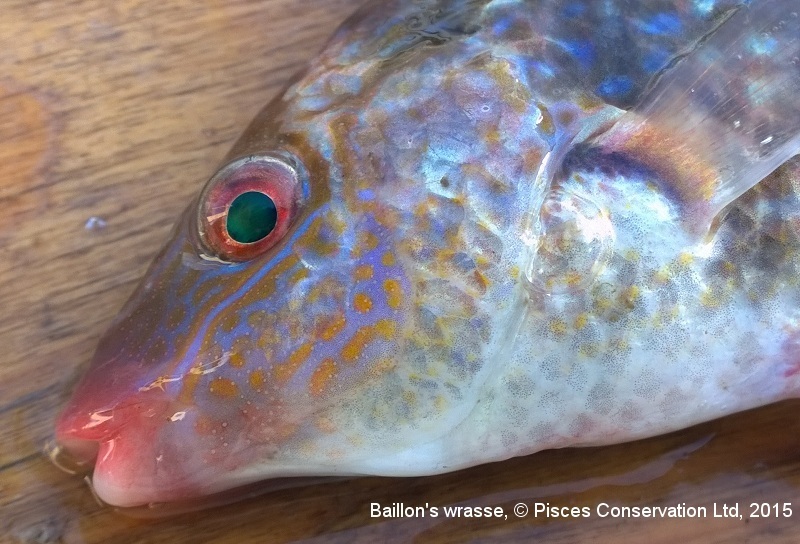 I cannot separate the fish from C. melops from the photograph. All within frequent variations. Only the pink fins are unusual for Sussex specimens, but not so much for Dorset captures. Black spot about 2/3 of the way back on the dorsal fin (it’s not 100% clear on the photo that it is a very dark actual spot, rather than an indistinct area of darker colouration). The Prussian blue colouration behind the pectoral, and dark stripe at the base of the pectoral. The pink fins and lips are very distinctive in the Southampton Water population; we see a lot of corkwing there also, never any with pink fins. Also (although I accept this probably isn’t definitive) the patterns below the eye tend to be orange blobs, rather than long orange stripes as in the corkwing. 5) black spot on caudal peduncle ? Our experience is that both species can appear either with or without the ‘definitive’ caudal spot. Quite a few of the corkwing we see are, unfortunately, deceased and often the spot has faded; equally, the juveniles don’t have it reliably. So we don’t really find it such a useful ID feature. Out of interest, do you have any photos of corkwing with pink fins? Would be very interested to see one. Black spot on caudal peduncle will not be visible in caught specimens as the vertical stress/sleep patterns obscure it. How reliable is the dark blue crescent behind the eye of the corkwing Crenilabrus melops? Not 100% reliable. I think it’s a second-rank diagnostic rather than a definitive feature, as the absence of it doesn’t necessarily mean it’s *not* a corkwing. If there are a couple of other things that point to the fish being a corkwing then it’s fine.